No one but the utterly naïve greenies believe that the Mann-made global warming hype is anything to do with climate – much less saving the planet. It is, as always, about power, influence - and money. Out of literally thin air, the money-men have been able to conjure up a brand new product on which to increase their riches, the fabulous "carbon" which in less than a decade will – they hope – underpin an "industry" worth more than $2 trillion a year. That alone justified the enormous effort which is being made to cement global warming as an issue in the public consciousness and, more importantly, in the legislative systems of the world. And it is the latter which is most important. Once the elimination of "carbon" is locked into enough legislative systems, it does not matter what people think – the revenue stream will be secure. 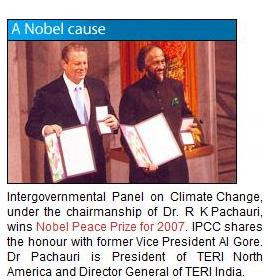 Bearing in mind that the issue is based on the central deception that the life-giving gas carbon dioxide is a "pollutant", behind the push to create this multi-trillion dollar industry is a vast nexus of influence, at or near the heart of which – it is emerging – is the chairman of the UN's IPCC, Dr Rajendra Kumar Pachauri. Carefully cultivating the image of the concerned "scientist", he has on the back of the global warming hype not only been able to amass a considerable personal fortune (about which he is extraordinarily shy) but has also built a powerful global organisation under the brand-name "TERI", as the front for his lobbying and power-broking activities. Its activities have centred around conducting research and organizing workshops/conferences to sensitize the decision-makers in North America to developing countries' concern about energy and environment. 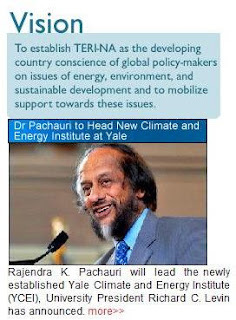 With Dr Pachauri as its president, it is being headed by a United Nations official, supposedly an impartial public servant, in charge of advising government on climate change. What is stunning, therefore, is to see the number of oganisations which are paying fees (sponsorship) to Pachauri's Washington operation. US readers, for instance, might be intrigued to learn that their tax dollars take a four-way hit. No less than four US government agencies pay into Pachauri's pot, the US Agency for International Development, the US Department of Energy and US Environment Protection Agency. plus the Lawrence Berkeley Laboratory, a US Department of Energy National Laboratory, which also pays a contribution. They are joined by the Norwegian Royal Ministry of Foreign Affairs and the Canadian International Development Agency. We also have the World Bank and the World Bank Institute listed. Indirectly, US taxpayers take another hit, being the major bankrollers of the United Nations. Four UN agencies contribute to the pot: the United Nations Development Programme, the United Nations Development Programme (GEF), the United Nations Office for Project Services and (strangely) the United Nations, Procurement Division, Missions and Project Procurement Service (MPPS). Given Pachauri's background, it is no surprise to find Big Oil represented, with Amoco Oil and Oman Oil listed amongst his sponsors. Then there is an outfit called FACTS Inc, described as "leading consultants in global energy". They, no doubt, sit easily with the giant defence contractor Lockheed Martin Energy Research Corporation and Science Applications International Corporation, the ninth largest defence contractor in the United States. Then there is the company specialising in pesticides and GM crops, Monsanto Enterprises Limited, plus Zuari Agro Chemicals Limited. It was incorporated in 1967 in financial and technical collaboration with the US Steel Corporation to manufacture urea. In 1973, Zuari Agro Chemicals Limited set up Goa's first mega industrial undertaking. This collection though, surely represents a greenie nightmare, which makes it all the more surprising to see the World Wide Fund for Nature (WWF) on the sponsor list. Another interesting sponsor, the Econergy International Corporation. Founded as a consultancy firm in 1994, Econergy became a world leader in Carbon Credit generation, the General Manager of a $20 million clean energy investment fund in Latin America, and through its public listing on AIM (a market operated by the London Stock Exchange), an investor and project developer in clean energy projects in Latin America, the Caribbean (LAC) and other emerging economies. In the same line of business, we also have GCSI Global - Global Change Strategies International - which has been taken over by Natsource Asset Management Services. This operation calls itself "a leader in the rapidly growing environmental markets, with a focus on the carbon market." It has approximately $800 million in assets under management and commitments and attempts to assist its industrial clients reduce the cost of complying with emissions targets and provide superior returns to its investment clients. Then we have organisations pushing renewables, including the Pembina Institute of Appropriate Development, and the International Development & Energy Associates, a Swiss-based organisation which has a remarkably low internet profile. And we also have ICF International. This calls itself a "global professional services firm, partners with government and commercial clients to deliver consulting services and technology solutions in energy, climate change, environment, transportation, social programs, health, defense, and emergency management." Another interesting sponsor is SNC Lavalin, a company with a distinctly unsavoury past, having been involved in fixing power construction contracts in India. Alongside such stars, of course, we have the great and the good, such as the Alfred P. Sloan Foundation, Foundation America, The Rockefeller Foundation (on which advisory Board Pachauri sits), the John D and Catherine T. MacArthur Foundation and the Ford Foundation. Needless to say, there is then a whole raft of greenie and quasi-greenie organisations, such as the Alliance to Save Energy co-chaired by James E. Rogers, President and Chief Executive Officer of Duke Energy, and the Global Environment Facility, chaired by Mrs Monique Barbut, formerly Director of the Division of Technology, Industry and Economics of the United Nations Environment Programme (UNEP). There is also money from the Burns and Roe Services Corporation, Charities Aid, the East-West Centre, the Environmental Law Institute, the Global Development Network, the Health Effects Institute, the International Development Research Centre and the International Institute for Sustainable Development plus the International START Secretariat. So it goes on. We have the National Renewable Energy Laboratory, the Public Private Infrastructure Advisory Facility and an outfit called Resources For the Future which aims to improve "environmental and natural resource policymaking worldwide through objective social science research of the highest caliber." The list of its board of directors makes interesting reading. Also counted as sponsors are the Pew Center on Global Climate Change, the SARI/Energy Small Grants Program, START (System for Analysis Research and Training) and the United States-Asia Environmental Partnership. American universities are also represented, with the University of California at Davis, the University of California, San Diego (UCSD) and the University of Waterloo in the line-up. The list finishes with the World Resources Institute, whose strategic director is William D. Ruckelshaus, a former administrator of the US Environmental Protection Agency, and the V Kann Rasmussen Foundation, Energy Foundation, which has "emphasized environmental grantmaking since it was founded in 1991." No one, it seems, can accuse Dr Pachauri of not having any friends and supporters. But, standing at the centre of this vast nexus of influence, he makes for some strange bedfellows, all apparently with a common cause.